Up until Mr. Shelly's recent review of uttapam, it had been quite a while since we checked out any Indian food on this blog. So, to make up for lost time, here's a look at yet another Indian dish: Trader Joe's Vegetable Biryani. We saw it on the frozen section shelf, right next to the uttapam, and it looked too good to pass up. I've been to a handful of decent Indian restaurants, but I've never heard of biryani before I saw this dish. Maybe I just wasn't scouring the menu hard enough—I have a bad habit of sticking with my old standby's all the time: chicken tikka masala or some kind of tandoori. Although it often pays to venture outside of your comfort zone, you can never go wrong with the classics. So now my habit is to try the very inexpensive version of each new-to-me Indian dish at Trader Joe's, and then if it really wows me, I might dare order it when I'm out livin' large, spendin' G's at a fine dining establishment. Note to self: order vegetable biryani next time you eat out at an Indian place. Because this stuff is pretty awesome. For $2.49, we're looking at a dish that's in the same price range as a typical Lean Cuisine or Healthy Choice meal, with similar fat and caloric content, but with way more uniqueness, flavor, and satisfaction. This meal is super-filling—but not uncomfortably so. It's packed with beans, peas, basmati rice, and meatball-sized vegetable dumplings. 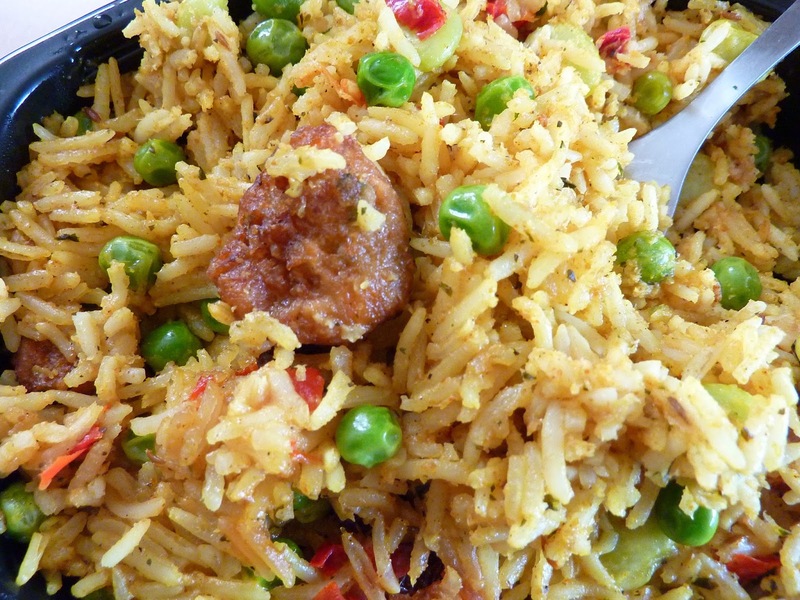 The dumplings and rice have the perfect amount of flavorful Indian spices. Nothing's too dry, nothing's too hard. It even has plump raisins to give it a nice sweet zing. The textures and flavors blend together beautifully, and the veggie and bean content is hearty enough to make up for the lack of meat. This entree is vegetarian. Not sure why it's not vegan, but it doesn't have that happy little "V" on it like some other Indian products from Trader Joe's. I'll let you vegan peeps read through the ingredients and tell me why it's just "vegetarian." This dish is special enough to garner double 4.5's from the Rodgers clan. We're fans. Unless you hate Indian for some strange reason, we can't imagine you won't like this. And for the price, there's not much lost if you don't. How is sugar not vegan?? I'm not 100% sure the details of it, but the way they filter (for lack of a better word) the sugar, it can't be considered technically vegan, I believe they use animal bones or something similar. No expert, clearly, but that, I believe, is the gist of it. It depends on how you define ‘vegan.’ Refined sugars do not contain any animal products, and so by an ingredients-based definition of vegan, refined sugar is vegan. However, some refined sugar is processed with animal bone char. The charcoal is used to remove color, impurities, and minerals from sugar. 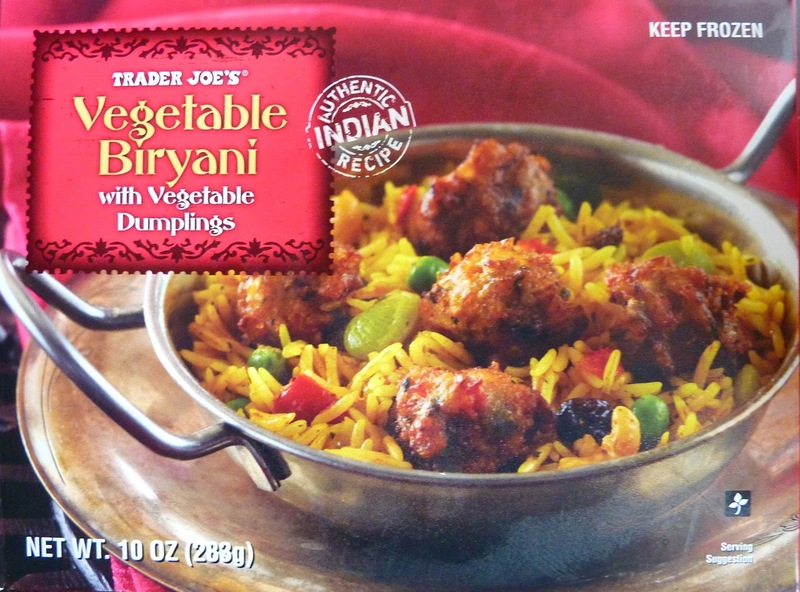 From Trader Joe's: "We do not consider our Trader Joe's Vegetable Biryani with Vegetable Dumplings Vegan because of the sugar used as an ingredient. This ingredient is purchased by our supplier as a commodity, therefore the processing is not tracked and the use of bone char may be used. Please know that when any of our TJ'S labeled products contains the ingredient sugar and our supplier tracks its processing and can be sure bone char is not used, we will always place the V Vegan symbol on the products label." Sorry, found this AWFUL!. Yuck. A dreary mess of a dish. Readers beware. So happy others feel the same. I will get my money back on this seeing as it was highly praised by the employee. You will be seeking a refund of the $2.50 or so you spent on this? Wow what a **** you are. This is delicious, I agree. I could eat those dumplings by themselves! Loved it. Paired it TJ Lamb Koftas and sautéed green beans. Yum. They still have lamb kofta? This is my favorite Trader Joe's item. YUM!! So, technically, if using bone-char sugar it's not even vegetarian then? It just has vegetable ingredients. Almost as bad as vegetarian labeled dishes that contain animal-rennet processed cheeses. Also, from the post above, if animal bone char comes in contact with the sugar than it does contain animal parts at some small level I would say. Technically a true "vegetarian" is(or should be) vegan, but in reality nearly vegetarians(as they call themselves) consume animal products too(eggs/dairy), just not meat...but even many of them will consume fish(not considered meat I guess). Also a vegetarian is typically about diet only, not for ethical reasons. First of all... 2 servings? Really? If u eat the whole thing it's 80 carbs and 520 calories!! I had one half cashew and 2 raisins in mine. The dumplings were delicious... the rice( spicy!) was DRY. So... even for 2.49... not a keeper. I just loved it. It's my third time eating this. It may be a bit salty, but that doesn't bother me. And, the price is just RIGHT. You can't please everyone .. but this product sure please ME. Just bought this on a lunchtime whim as I needed something to eat when I returned to the office. I grade this to be delicious. Enough spice to feel it, a touch of cardamom to make it have an authentic taste and perfectly individual grain of basmati rice (meaning it's not stuck in a globby pile). I will be buying this again as I expect my roomie will love it.